We pickup up some unusual looking structures. Turns out they are training wheels for teaching extreme driving. They are specific for Ford 1 ton vans and Marmon Tractor Trailer Semi Trucks. They hydraulic reduce the weight on the tires as well as providing outrigger support so that these large vehicles can slide at low speed on dry pavement surfaces. This allows safely teaching extreme driving techniques for slipper conditions such as icy surfaces and extreme maneuvers at high speeds. They can be adapted to other vehicles. This page contains a single entry by Cavlon News published on October 17, 2012 8:57 AM. 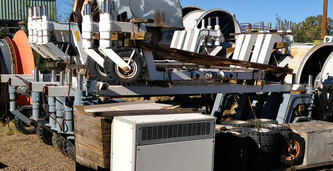 Pending new item--200 KW genset was the previous entry in this blog. YES, We can repair liquid to air heat exchanger coils that froze with water in them. is the next entry in this blog.